Maybe you've heard wonderful success stories about online dating but are a little intimidated to try it. Or perhaps you think there are no terrific men your age. That's how journalist Judsen Culbreth felt until she gave online dating a try. She discovered that older single men significantly outnumber women on online dating sites, and, more important, they're eager to make a match with someone who shares their interests (and generation). She also gently offers you personal wisdom, from uncovering your mental roadblocks to dating and revamping your image, to brushing up on the world of men and how to approach the ever-important topic of intimacy. Filled with real life success stories, checklists, worksheets, and fun facts to get you motivated and courting the smart way. 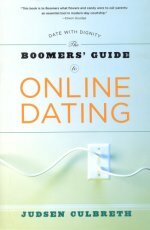 The Boomers' Guide to Online Dating is the reassuring resource you need -- your handbook to finding the perfect man.